In operation, components in a wide variety of applications undergo vibrational wear. Fretting tests are regularly run on the macro-scale in order to examine material behaviour under these conditions. The nano-fretting module allows investigation of fretting and reciprocating wear at the micro/nano scale filling the previous metrology gap. 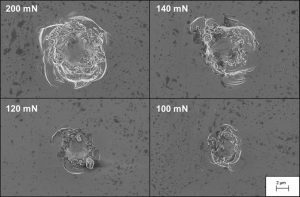 This capability allows examination of the effect of small oscillatory micro-motion on the durability of complex systems such as hip prostheses where small particles trapped between the ball and socket can slowly damage the contacting surfaces. Fully programmable experimental conditions: The nano-fretting hardware allows oscillation frequency and amplitude to be set. This enables customisation of experiments to simulate different wear behaviours. High cycle wear: The excellent stability of the NanoTest Vantage nano-fretting module allows reliable evaluation of high cycle wear behaviour – up to 1 million cycles in a few hours of testing. Friction measurements: The Nano-fretting module incorporates friction measurements allowing accurate measurement of frictional forces during fretting providing an indicator of subtle changes in wear behaviour. Flexible indenter geometry: The NanoTest Vantage gives the flexibility to use either large diameter probes or conventional nanoindentation probes. This allows testing under a wide range of contact pressures enabling more accurate simulation of real world contact conditions. 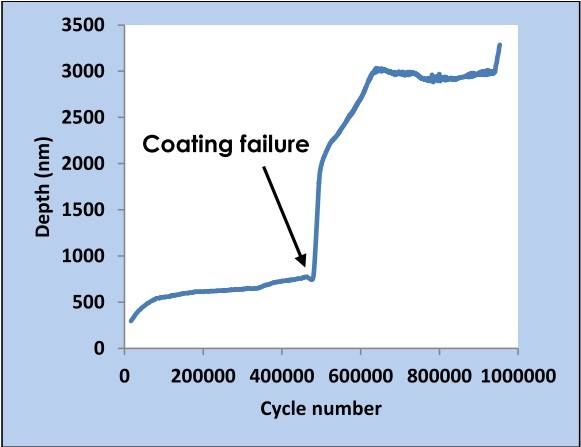 Figure 1: Data from a million cycle nano-fretting experiment on a DLC coating on a silicon substrate. The coating fails after around 450,000 cycles. 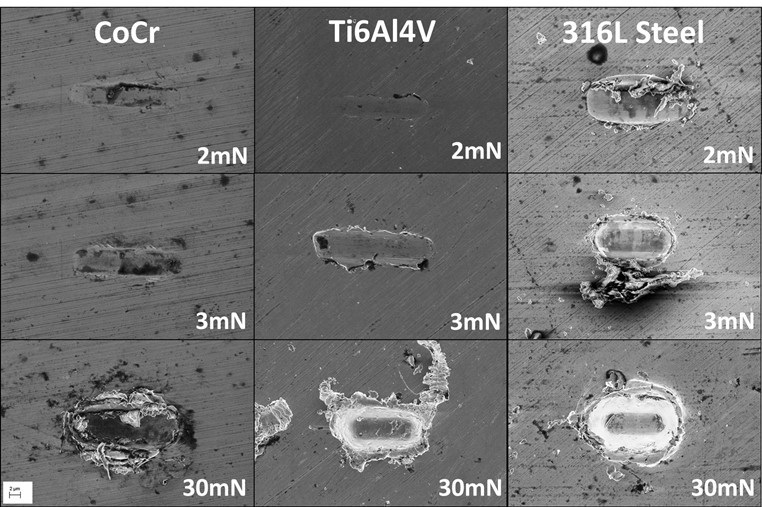 Figure 2 – Fretting scars from experiments on uncoated silicon. An increased wear rate is seen in experiments above 120 mN fretting load. Figure 3 – Load dependence of fretting tests on alloys for biomedical applications. The nano-fretting module as proven to be a useful tool assessment of new materials for use in biomedical implants. With the flexibility in the applied load and the wide range of contact geometries available, the nano-fretting module can be used to simulate a wide range range of different wear conditions. Low forces and large probes can be used to simulate high cycle low pressure contacts whilst smaller probes and higher forces can be used to simulate the high pressure contacts due to single asperities or particles trapped in the implanted joint. Figure 3 demonstrates the load dependence of fretting wear on 3 alloys commonly used in biomedical applications. The SEM images highlight increased surface damage with increasing load and highlight the weakness of 316L steel to this kind of wear. Figure 4 – Typical depth and friction data for a fretting test on a thin DLC coating. The fretting module also allows researchers to gather friction data during wear experiments. This can be used to examine the evolution of friction in the contact as the material wears. 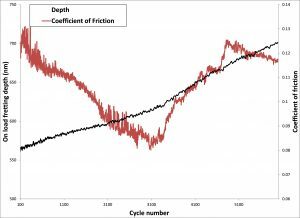 Figure 4 shows tpical depth and friction data for a fretting test on a thin DLC coating. The friction dramatically increases after coating failure corresponding to a change in wear rate observed in the depth signal.